In Pattaya and other areas of Thailand there is no shortage of young, attractive Thai ladies. One thing is for sure, where there's beautiful Thai girls there are bound to be scams taking place. Not all Thai women are bad, in fact most of them are generally good people. Places such as Pattaya tend to attract ladies with a need for money. If you speak to ladies that are working in the Thai nightlife, you will find that many of them have children. Typically, their children will live in the care of their grandparents, with the mother usually having to support all of them herself. In Thailand, it's rare for the father of a child to support the child financially after breaking up with his child's mother. The minimum wage in Thailand is also very low (around 350 THB per day, or $11 USD), working in the nightlife scene and mixing with foreigners can allow Thai ladies to earn much more money per night, supporting themselves and their families. Many Thai women meet foreign guys and get into relationships. Often the foreign man will need to support his girlfriend and her family with money, this is normal in Thai culture when you start to establish a serious relationship. However, if you are being lied to or scammed, your money could be better spent elsewhere. As leading private detectives, we can help save you money by exposing Thai ladies that lie and cheat. Bar girl scams in Pattaya Pattaya has no shortage of nightlife and there are thousands of bar girls living and working in the city. Often bar girls will claim that they're not being "bar fined", or leaving the bar with customers, but in fact they are. Often times bar girls will aim to have multiple boyfriends sending them money every month. Our job as private investigators is to expose the lies told by bar girls and bring our clients the truth. It can be much cheaper to hire us and discover the truth of a situation and we offer free quotes for all work undertaken. If you would like to learn more about bar girl scams, then read our bar girl investigations blog post. Internet dating in Thailand Internet dating is very popular in Thailand. However, a hidden danger behind this is that many prostitutes use dating websites and popular dating apps. These women understand that by claiming to have a university education and an entry level job, they will make themselves seem much more attractive to foreigners. Often by the time a serious relationship has come about, a boyfriend will be too in love with his Thai girl to break off the relationship, even if he discovers that she has been lying all along. It's very common for Thai ladies to lie about where they work and their relationship status when they're trying to hook up with foreign men. If you'd like to learn more about this and how we can help you, please read our blog post about the risks of internet dating in Thailand. If you're getting involved with a lady that lives in Pattaya, it's important that you do your own due diligence and check her out. As leading private investigators in Thailand we are able to supply our customers with cellphones pre-installed with monitoring software, which allow you to record all messages sent/recieved, GPS locations, and can be monitored from anywhere in the world. 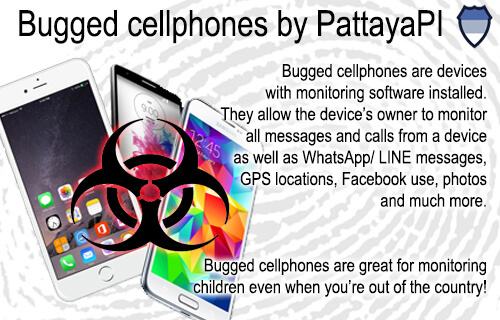 These cellphones can be sent to any address in Thailand. We can also investigate people using more traditional methods. For personal surveillance we charge just 1,000 THB per hour. We can also setup "sting" operations on suspected cheaters in Pattaya. Send us a message today with the details of your case and we'll respond back to you with a free quote. Do you need a bar girl detective in Pattaya? If there is one thing Pattaya has no shortage of, it’s nightlife. The city is filled with thousands of different beer bars, bar complexes, a gogo bars, clubs and discos. Thousands of foreign men visit Thailand each year and meet Thai ladies working in the adult entertainment industry. Many of these men will go on to marry their Thai partners and even have children together further into their relationships. However, there is a more sinister side to relationships with bar girls in Thailand. Often these women are from poor families in the north of Thailand and struggle to earn enough money to support themselves. The minimum wage in Thailand is very low, at only around US $11 per day. Thai ladies often look to their partners for financial support, this is typical if the lady is in a relationship with a foreign guy or even a Thai man… Once in a committed relationship the man is expected to help out with money for the lady and her family in Thai culture. Sadly, many bar girls in Pattaya take advantage of this and try to have multiple boyfriends sending them money at the same time. Often, they will continue to sleep with other men while already in relationships, with the goal of earning (or being given) more money. This is a real problem for men looking to get involved with ladies that work or have previously worked in Pattaya nightlife. As a detective agency based in the city, we have helped countless men discover the truth about their Thai girlfriends. We will take the time to listen to your situation and offer advice on the best way we can help deliver you the truth. If a Thai lady is working at a beer bar, an agogo bar, or if she regularly visits freelancing spots such as Lucifer or Insomnia, it’s very easy for us to help you by discovering if the lady is open to engaging in more relationships with other guys. Is she still working in the bar? Can we "bar fine" her? Is she where she says she is? Is she leaving the bar with customers? After hiring us, there will be no need to worry about what your girlfriend is doing while you’re out of the country. We can deliver you truth professionally and discreetly. Simply send us a message explaining your situation and we will be glad to send you a free quote. At PattayaPI, we have completed many successful operations in the northern region of Thailand (known as Isan, Isaan, or Esarn). We believe this is a very important part of our work, and here's why. Many Thai people grow up in the north of the country, typically in rural farming communities but move to either Bangkok, Pattaya or Phuket to find work and earn money. It is widely accepted that the majority of ladies working in beer bars, massage parlors, or elsewhere in the tourist industry have come from Isaan in the north of the country. Typically they will leave their children in the care of their grandparents while they work and send money back. In this region of Thailand the Laos language is spoken. This dialect is not typically learned by foreigners living in the kingdom and many people find it hard to understand the subtle cues of this language. It is very important that we retain staff from all walks of life and positions in the Thai class system in order to complete investigations successfully. This could not be truer in Isaan. We treat all cases sensitively and with complete discretion. 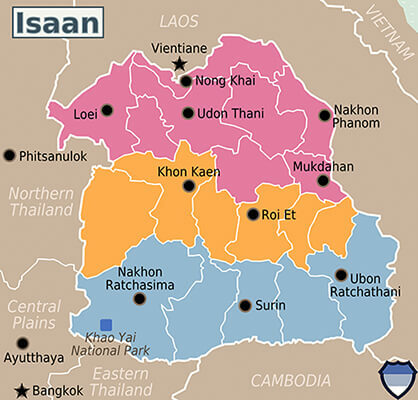 Well known provinces in Isaan include Buriram, Surin, Khon Kaen, Udon Thani, Kalasin and Nong Khai. Although people from all the different provinces tend to migrate to Bangkok or Pattaya for work. We are able to work in all provinces of Thailand. Many people's secrets lay in their hometowns, and in some cases the only way to get to the bottom of untruths is to go directly to their homes, in the small communities of Isaan. We have developed unique methods of social engineering which combined with regular investigative techniques; allows us to deliver an excellent service to our clients while providing value for money - almost anywhere in the kingdom. If you find yourself needing a private investigator in Isaan, get in touch with us today and see how we're able to help you. We offer free, no pressure quotes for all work. On behalf of everyone at PattayaPI we would like to wish our clients, both new an old, a very happy Songkran. The Songkran water festival, otherwise known as the Thai new year, is always a time for happiness and celebration across Thailand. It is celebrated at different dates across the kingdom, with Songkran in Pattaya taking place on the 18–19th of April. Despite this being a jovial time of year in Thailand, Songkran often marks an increase in road accidents and deaths. This is partly caused by irresponsible revelers drinking and driving, partying near busy streets and spraying water into the faces of speeding motorcyclists. Due to poor water sanitation in Thailand it has been claimed that the festival marks an increase in the transmission of water borne diseases... So try to prevent the water from being blasted into your eyes, ears and mouth where possible! We hope that foreigners visiting Thailand during Songkran will be considerate to others and have a great time during the festival. Be aware of the risks, stay safe and enjoy yourselves in this wonderful country. Happy Songkran! Have you met a Thai bar girl over Songkran?... Maybe you're worried about what your girlfriend is doing when you're not in the country? We have investigated countless Thai ladies in Pattaya from all walks of life and can offer free advice on your situation. Send us a message now with information about your case for a free quotation.